Dr. Barzilay and his team welcome you to the open house at our dental office to celebrate Canada's 150th Birthday! Mark your calendar for June 30, 2017, from 11am to 4pm and bring your family and friends for an afternoon of celebration filled with food, face painting, photo booth, and plenty of prizes. We also have ballots for the TiCat Tickets for their home opener game on July 15, 2017! This offer is only valid for guests who attend our open house. We are excited to see you and celebrate Canada's 150th birthday with you all! June 2017: Tips, ENews & More! Everyone knows that summer = ice cream (yes, you can eat ice cream anytime you want, but it's far more delicious when you're enjoying it under the summer sun). We want to make sure you eat as much ice cream as you can, without worrying about your teeth. 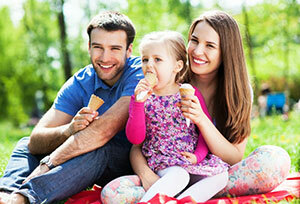 So schedule an appointment with us today to check up on your oral health and get ready for ice cream season! Don't forget to buy extra ice-cream for Father's Day on June 18th. Happy Father's Day to all the dads out there! Whether your kids will be enjoying their summer vacation at home, or at camp, be sure to remind them that a break from their regular schedule does not mean a break from good oral hygiene. Bring them in for an appointment so we can ensure they start the summer off right. Smiling for a photo shouldn't make you anxious. Whether its teeth whitening or a complete smile makeover, we've got you covered from ear to ear - literally - so you can smile at the camera with complete confidence. Our Hamilton Tiger-Cat draws are back! As a token of our appreciation for your loyalty and support, we want to send two lucky patients to each home game of the Ticat's season. To Enter, simply provide us with your name and email address, or fill out a ballot in our office. The winners will be notified throughout the month on our website and Facebook page, as well as the following editions of our newsletter. Keep an eye on our Facebook page and newsletters for winners and upcoming contests! Do others complain about your loud snoring? Chronic snoring can be a symptom of a more serious condition that not only affects your bedmate, but also affects your quality of life and potentially your health. Chronic snoring can be a symptom of many disorders, one being Sleep Apnea. Apnea is defined as "the temporary reduction or cessation of breath". Obstructive sleep apnea occurs when these interruptions in breathing occur for periods of 10 seconds or longer while you sleep (with the severity of your condition determined by how many times it occurs in an hour of sleep). 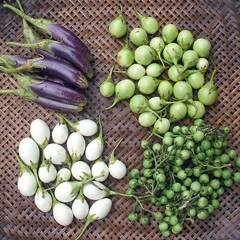 Instead of throwing burgers or steaks on the grill, why not pick up a few fresh eggplants from the local farmers market? Eggplants are rich in vitamins and antioxidants, and this Italian-inspired veggie sandwich takes just 15 minutes to prepare.